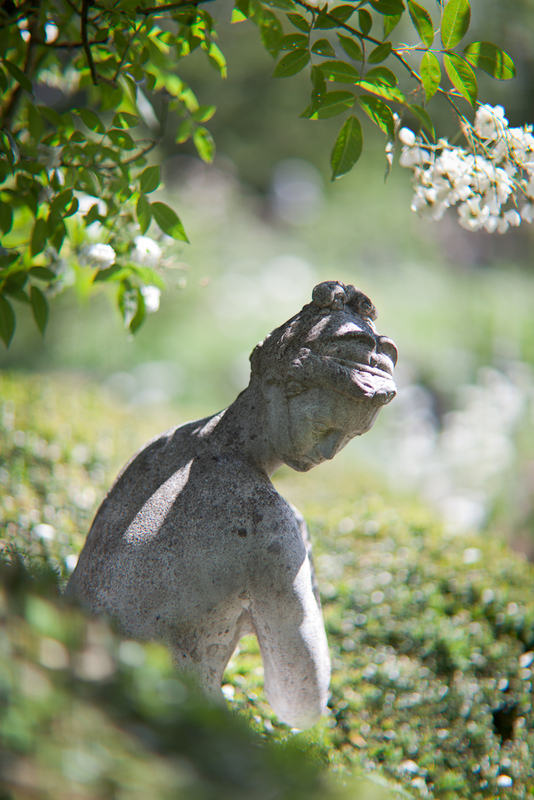 Monty Don will this week be exploring the garden at Charleston, situating its unkempt allure – as Woolf would have it – within broader 20th Century shifts in garden design. The rich history of the Charleston Garden was explored on the blog earlier this year, and we urge those eager to tune into Monty Don’s ‘The Secret History of the British Garden’ to take a look. From the attic we have become accustomed to a bird’s eye view: hedgerows, roses and gravel paths unfurl behind glass, framed by large North-facing windows. Even the thickest condensation (and inevitable wintery transformations) cannot conceal the colourful imagination and flair for flora and fauna. Our panoramic perspective has provoked an even keener excitement for Monty Don’s programme: he promises rather a digging deep, an up-close look at the culture and conditions producing the garden so central to the artistic lifestyle at Charleston. In 1986, with this vigorous and improvised spirit in mind, Sir Peter Shepheard set about restoring the garden, by then so densely overgrown that even Woolf would have struggled to see its idiosyncratic beauty. 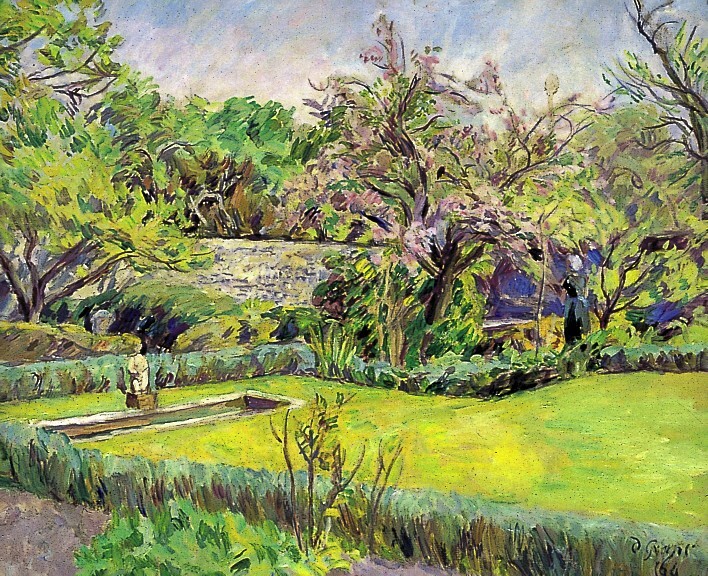 Shepheard, hoping to reinstate Charleston’s greenery as ‘an apotheosis of the traditional English cottage garden’, was broadly guided by Roger Fry’s 1917 designs, supplemented by a heady mix of paintings, photographs, correspondence, and memory. Amidst sketches of centaurs, sleeping children and Sussex landscapes – an interweaving of fantasy and reality commensurate with the role of the garden itself – we recently discovered this litany of floral possibility. CHA/P/2438/10. Recto. List of seed varieties. Pencil on paper. Photograph © The Charleston Trust. Purchased, planted or simply desired, this faintly pencilled list of flowers gestures to the central role occupied by the garden in daily artistic inspiration. Practical notes on seed variety and quantity rest comfortably against figure studies and frivolous doodles. Certainly more verbal than visual, the list nevertheless possesses a peculiarly aesthetic quality: an indecipherable code of circles, stars and full stops attend ‘Candytuft’, ‘Sweet William’, ‘Tobacco Plant’ and ‘Forget-Me-Nots’. Whether or not sown in soil, these imagined flowers blossom throughout Bell and Grant’s sketchbooks. CHA/P/2404. Recto. Study of poppies. Paint on paper. CHA/P/2403. Recto. Study of roses. Paint on paper. Photograph © The Charleston Trust. CHA/P/2406. Recto. Study of flowers. Paint on paper. Photograph © The Charleston Trust. While photographing the box of loose works on paper from Duncan Grant’s studio discussed in a previous post, we came across two items of particular interest. 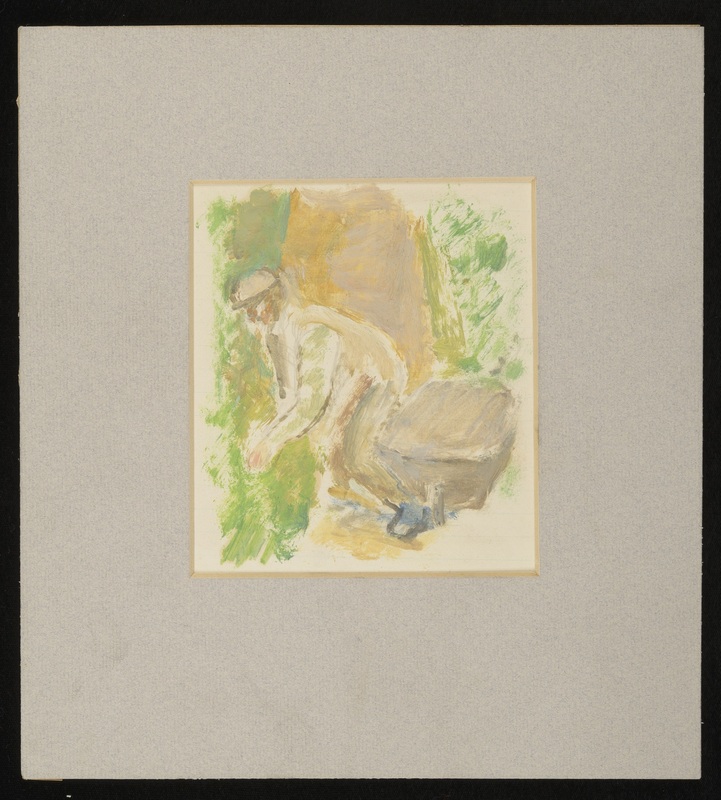 One is a small painting on lined notepaper posthumously attributed to Vanessa Bell, of a man tending to a flowerbed with a wheelbarrow at his feet. The other is a profile portrait sketch, likely to have been made by Grant. 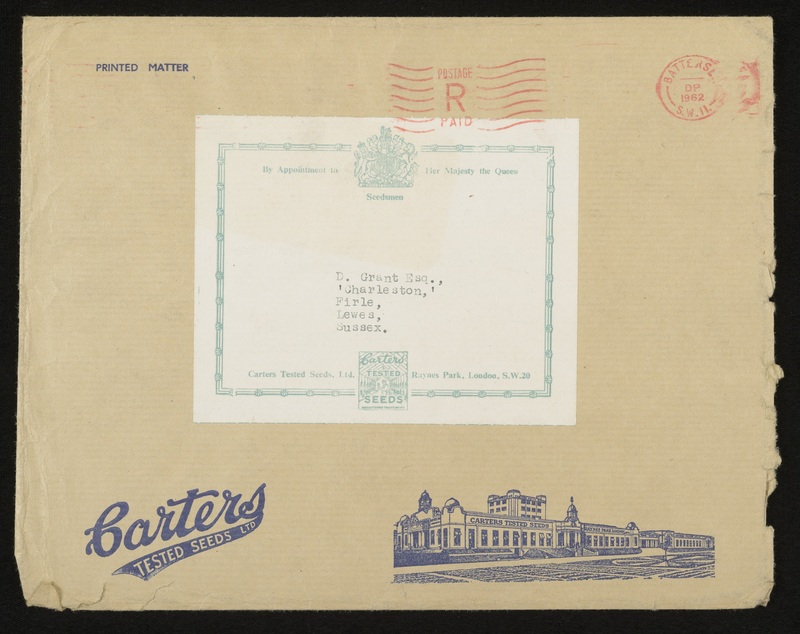 Although this sheet had been reserved and boxed up with other items in the Gift due to the drawing, it is the reverse of the work that is especially interesting in this instance; it is an envelope addressed to Duncan Grant, postmarked 1962, from Carters Tested Seed Ltd. These two items provide a wonderful insight into one of Bell and Grant’s shared passions and sources of artistic inspiration at Charleston: the garden. Letter from Virginia Woolf to Vanessa Bell, May 1916. Grant and Bell were enthusiastic gardeners who worked tirelessly to transform the muddy, overgrown gardens first encountered by Woolf in 1916 to the dense riot of colours, scents and textures it was later to become. 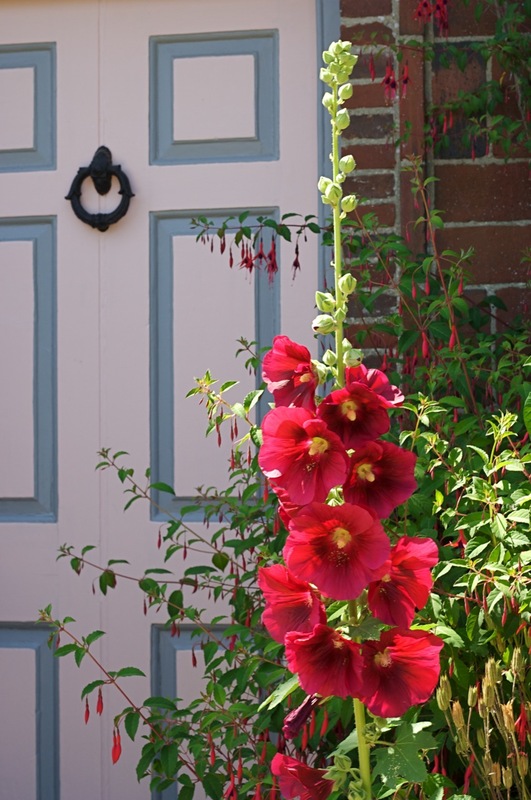 First used to supply the household with fruit and vegetables during the First World War, towards the end of the conflict Bell turned her attention towards improving the garden as a space for pleasure. 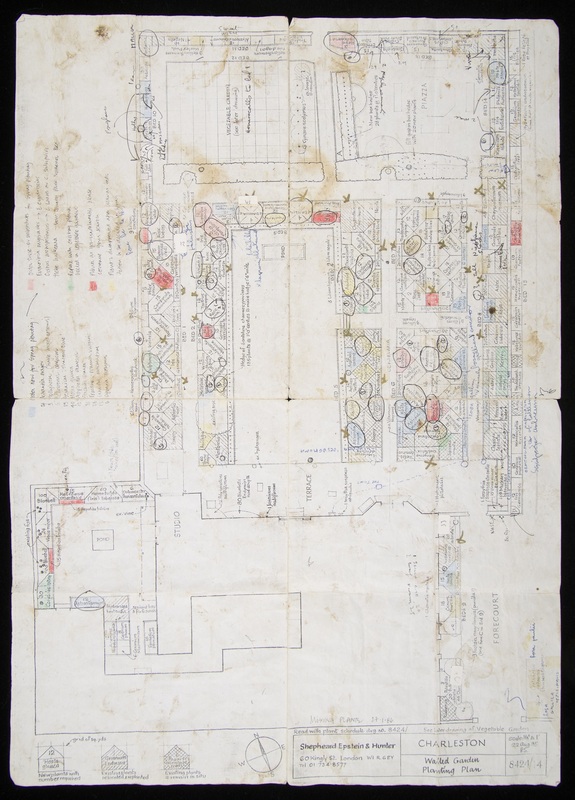 Roger Fry assumed the role of garden designer, drawing up his first plans for the walled garden as early as 1917. Employing the rational aesthetic principles he championed in his writing, Fry created a grid of intersecting paths and box hedges which framed a lawn inlaid with a small rectangular pool. Within this framework richly scented, brightly coloured and dramatically shaped flowers were planted, interspersed with subtle silver foliage; red-hot pokers, hollyhocks, foxgloves, globe artichokes, roses, poppies, lavender, alliums, nasturtiums, dahlias and zinnias. Grant in particular was an obsessive plant collector, and regularly purchased seeds to be cultivated at Charleston – the envelope from Carters Tested Seeds Ltd. is likely to have once contained a catalogue or invoice for new acquisitions. In addition to employed gardeners, Bell and Grant were helped in the garden by Maynard Keynes, who could often be found on his hands and knees weeding the gravel borders. It is unsurprising that the air of creativity fostered inside the house, with its painted surfaces and modern artworks, was to spill out into the garden. 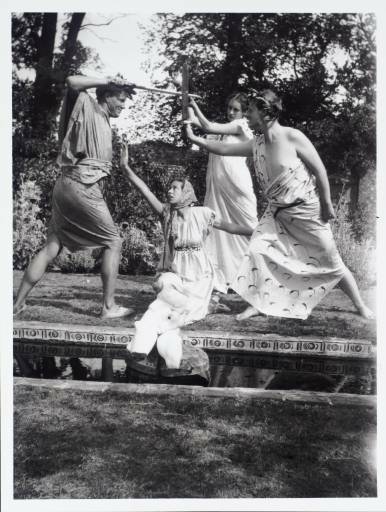 The spaces surrounding the house assumed numerous roles: an outdoor studio with an unlimited supply of props for painting; an al fresco gallery ideal for displaying sculptures and art-school models collected by Grant; secluded spots offering quiet and privacy for contemplation, reading and writing; a perfect auditorium for performing theatricals complete with hand-made props and elaborate costumes. The house seems full of young people in very high spirits, laughing a great deal at their own jokes… lying about in the garden which is simply a dithering blaze of flowers and butterflies and apples. 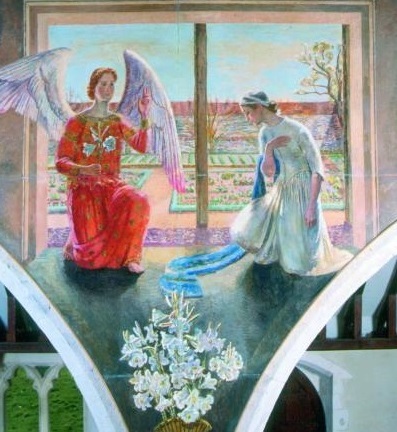 Vanessa Bell, The Annunciation, mural, c. 1942. Berwick Church, Sussex. When the Charleston Trust was formed and the house restored in the 1980s, celebrated landscape architect Sir Peter Shepeard reconstructed the garden to Fry’s own plans, searching for references in paintings, early photographs and archived letters in order to create a faithful reproduction. 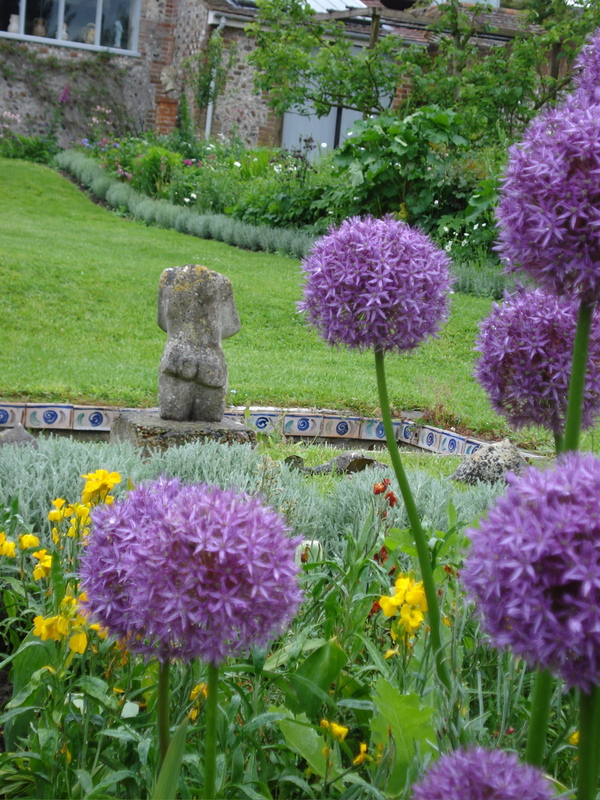 While the walled garden was largely neglected in Grant’s old age, many of the original shrubs did survive and were retained. The new plan drawn up by Shepeard’s is still used by Charleston’s Head Gardener, Mark Divall, who works hard throughout the year to maintain the beautiful and unusual gardens which enchant so many visitors today. Annotated, dog-eared and stained from over twenty years of use, this document has acquired its own relic-like status and sits comfortably alongside the two Gift items. Together they hint at a visual biography of a space that was of vital importance to the creative and progressive way of life at Charleston.